When you are ready to step up your milkshake game head over to D-Luxe Burger at Disney Springs and order one of their incredibly elaborate, incredibly fantastic gelato shakes. You have basic chocolate and vanilla options, but they are not so basic here. Seasonal flavors like Pumpkin Pie in the fall are also featured on the menu. Other specialty shakes are also found here like the Salted Caramel Gelato Shake (Vanilla Gelato blended with Milk, Caramel Syrup, and Hawaiian Black Sea Salt, topped with Whipped Cream, Caramel drizzle, and Hawaiian Black Sea Salt)—definitely artisanal based on that description. If you are having a burger here too you might just want to request 2 straws for one shake, or you’ll be rolling out of Disney Springs. Yes, I know this is sort-of plain Jane as far as specialty drinks go, but this one has a special place in my Disney nostalgia. You can find the vanilla (or cherry) coke in various locations, but my 2 favorites are Sci Fi Dine In Theater and 50’s Prime Time Café in Disney’s Hollywood Studios. The flavored soda just fits perfectly with the retro theme of those restaurants. And don’t misunderstand, this is not the “pre-flavored” vanilla coke brand . . . but a coke flavored with vanilla syrup. And that makes all the difference. We are going back to Disney Springs for this super rich version of hot chocolate found at Amorette’s Patisserie near the World of Disney. Many love Ghirardelli for their hot chocolate, but this kicks it up to a whole new level. This may be akin to drinking a chocolate bar. It is served in a small cup (reflecting the richness of the flavor) and is topped with Chantilly and shaved dark chocolate. Yummmmmm. The perfect way to cap off your evening in Disney Springs. And shout out to Amorette’s as they have offered up several very good seasonal drinks on their menu, so keep any eye out for those options. What you say? POG is Passion Fruit, Orange & Guava juice and it is delicious. My favorite breakfast beverage of choice while at Walt Disney World. I don’t know if it technically qualifies as a specialty beverage (it certainly did in its slushy form at Animal Kingdom), but it is definitely special to me. You can find POG at several restaurants including Kona & ‘Ohana at the Polynesian, Boma at the Animal Kingdom Lodge and Tusker House at the Animal Kingdom. It is refreshing and has just the right mix of sweet and tart. Over at the Magic Kingdom, Skipper Canteen in Adventureland serves up lots of great food (some exotic) with a fun take on the Jungle Cruise theme. The Schweitzer Slush is frozen apple juice topped with passion fruit and green apple boba balls. Of course the name pays homage to Schweitzer Falls on the Jungle Cruise, coincidentally named after the famed explorer Albert Falls. But the drink is really good—give it a try. Can you tell I have a think for milkshakes and dessert drinks? Let’s hop back over to Disney’s Hollywood Studios and 50’s Prime Time Café for this unique and delicious specialty beverage. The Peanut Butter and Jelly Shake is a great fit with the theme here & mom’s kitchen from the 1950s. My favorite way to order this one is at the end of my meal to-go for dessert. In the past, the shakes here have been enough for two people when you are taking them to go. To me I don’t taste too much of the jelly in the shake, but it is definitely some peanut buttery goodness. If you are dining at Liberty Tree Tavern in Magic Kingdom’s Liberty Square, you may want to give the Patriot’s Slush a try. The Patriot’s Slush I feel sure is a recipe direct from one of our forefather’s kitchens—a frozen apple and cherry concoction that is a very pretty color (and tasty too). If you are able, think about getting one in a souvenir mug. Let’s stick to the Magic Kingdom for another frozen specialty drink found at Gaston’s Tavern in New Fantasyland. LeFou’s Brew has been my go-to refreshing snack in the Magic Kingdom since that area opened. I love the flavor combination, as well as the setting at Gaston’s Tavern. This one is also frozen apple juice (they go through a lot of that in the Magic Kingdom, hope The Evil Queen doesn’t find out), with a hint of roasted marshmallow (I love the depth this adds) and topped with passion fruit mango foam (that gives it a little tart kick). Mix it all together and yummmmmm! Perfect for just about any day in the Magic Kingdom. Found at Pongu Pongu in Animal Kingdom’s Pandora—The World of Avatar, this multi-colored drink would definitely win the prize for most beautiful. Reflecting its surroundings in Pandora it is a vibrant purple layered with bright green and another purple layer, then topped with orange boba balls. The flavors are just as delicious as it is pretty. It is a frozen mix of limeade, apple and desert pear flavors, and the boba are passion fruit. It is so good and refreshing! And if you don’t care for the texture or flavor of the boba balls you can request to not have those added. I highly recommend this beverage while you are in Pandora, it is tasty & instagrammable. I saved this specialty beverage for number 1 because it is only available seasonally. Which makes it sad and exciting at the same time . . . the whole idea of absence makes the heart grow fonder. 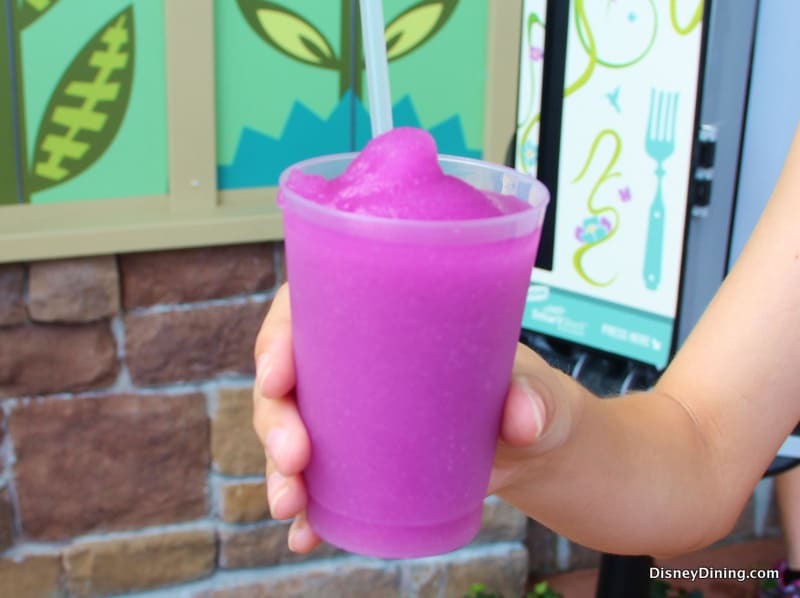 The purple beverage is found at Epcot during the International Flower & Garden Festival. And every year I hold my breath to make sure they are going to bring it back again. Served frozen and topped with an edible flower grown in the Land Pavilion, this beverage has a hint of lemon for brightness and a floral flavor combined. I absolutely stop to get one of these every time I pass the kiosk. And I am not the only one. Do yourself a favor and schedule a vacation during the Flower & Garden Festival, Epcot is never more beautiful and this drink is life. What are your favorite non-alcoholic specialty beverages at Walt Disney World?